We have my father to thank for this recipe. 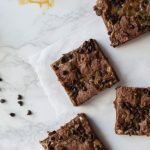 Fudgy German chocolate bars scattered with chocolate chips and sticky caramel. A match made in heaven. 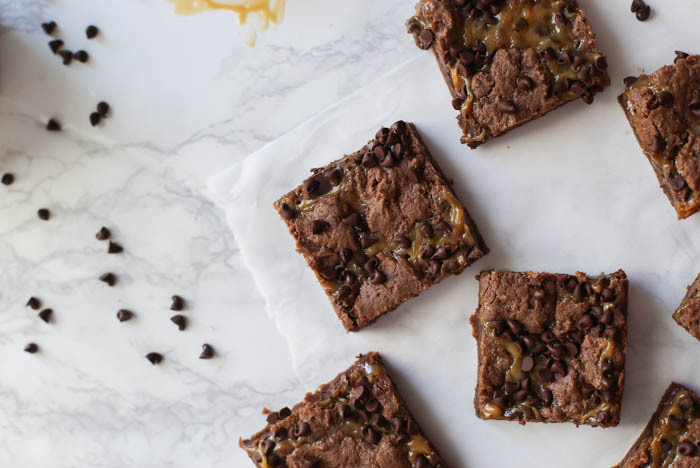 Think of these chocolate caramel bars like brownies, only on crack. I’m not sure where my dad got this recipe many years ago, and I can’t remember how young I was when he started making it. But I am sure glad that he learned how to make it, and decided it would be the dish he contributed to all family gatherings from then on out. To celebrate my dad’s birthday, which was a week ago (hi dad! ), I made some of my very own chocolate caramel bars. We’re also celebrating my first blog post in two months! Yay! Things get very busy from October-December over at The Homeless Children’s Playtime Project, which is my full-time gig. That, and a full calendar are responsible for the lack of time I have for my favorite hobbies aka this wonderful blog. Don’t worry though, in the new year I’ll be back cooking for ya regularly. So these bars. They are fudgy. 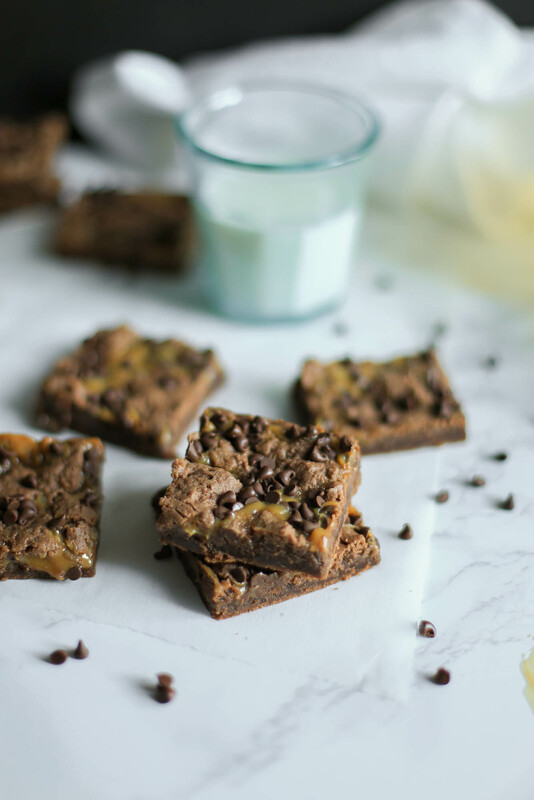 They are chocolaty, and caramelly, and sticky, and oh so wonderful. Like, you get to lick your fingers after eating one, wonderful. 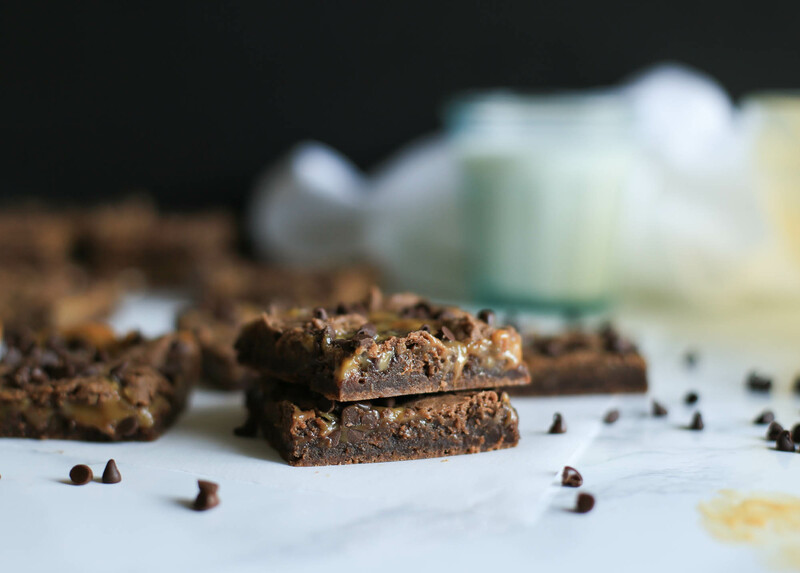 My dad has brought these chocolate caramel bars to potlucks for years, and they are still specially requested. As soon as I sat down to start peeling the wrappers off each caramel, I felt ten years old again, helping my dad in the kitchen. When I was younger, this process seemed to take absolutely hours but is no more than minutes in reality. We always got to eat one caramel too… which may or may not affect the balance of the entire final recipe. Who knows? Are you willing to take that risk? Or perhaps you will eat a caramel, just in case? I did. I ate three. For the batter, it is German chocolate cake or bust. 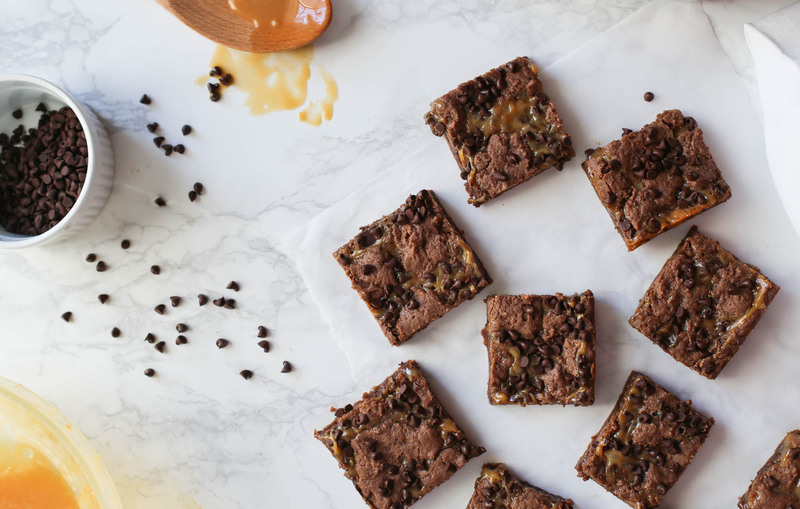 No short-cuts there, the German chocolate flavor makes the bars. And then, once the bars are all assembled, the kids get to clean any leftover batter out of the bowl. (You can start to see why I loved ‘helping’ with this recipe.) Once the bars come out of the oven though, the hardest part is waiting until they cool enough to cut into. But always, always worth the wait. See dad? I did learn to be patient after all. Preheat the oven to 350 degrees F. Grease a 9 x 13-inch baking pan with cooking spray. Remove the wrapping from all the caramels and place them in a glass bowl. Add 1/3 of the evaporated milk to the caramels. Place in the microwave to melt the caramel, being careful not to burn. 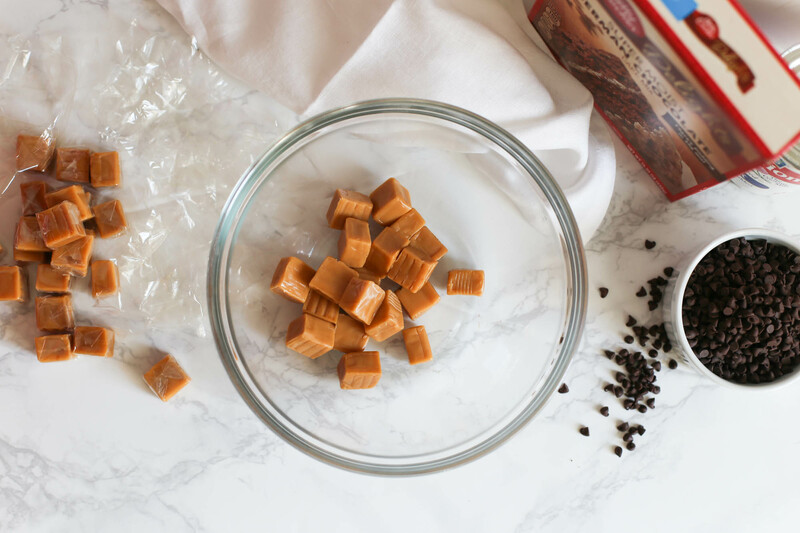 It’s best to melt the caramel in 30-second increments, stirring in between each turn. Melt until smooth, about 90 seconds total. Place a little more than half of the cake mixture in the bottom of the baking pan, spreading evenly. Bake at 350 degrees for 8 minutes. Remove the pan from the oven. Sprinkle half of the chocolate chips on the hot cake. Add all of the caramel mixture on top, then add the remaining cake mix in small spoonfuls (slightly flatten the clumps to cover more cake). Sprinkle with remaining chocolate chips. Bake (at 350 degrees) for 18 more minutes. Let cool completely before cutting. Enjoy! The bars can be stored in an airtight container at room temperature. I only use Pillsbury German Chocolate cake mix. It’s not nearly as good with Duncan Hines. Thanks for the tip – direct from the pro! I made them today! The brownies were great. I used a box of dark chocolate cake mix. Love the dark chocolate idea!